The largest global sports media property in Asian history, ONE Championship™ (ONE), will return to Malaysia’s bustling capital city of Kuala Lumpur. On March 9, 2018, “ONE: Visions of Victory” will ignite the Axiata Stadium with another evening of authentic martial arts action. 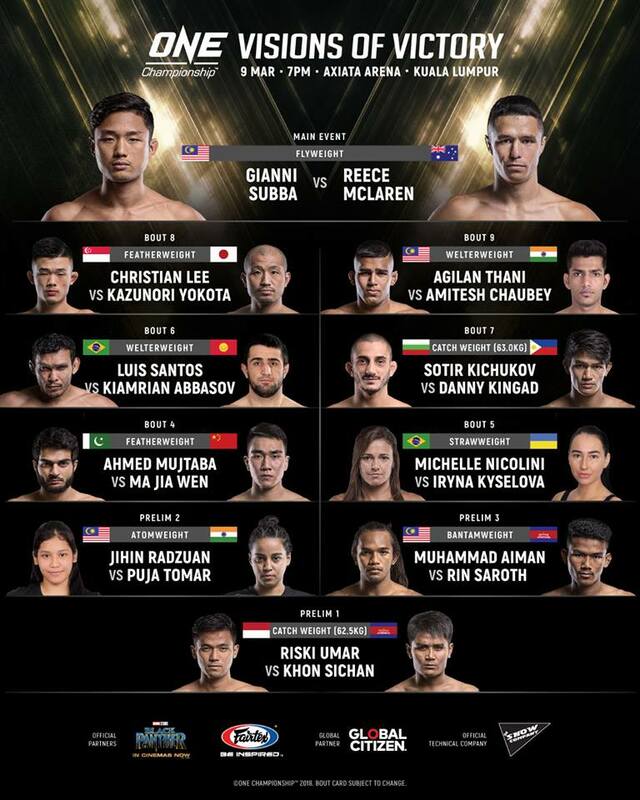 In the main event, Filipino-American Reece “Lightning” McLaren, 26, of Toowoomba, Queensland, Australia will face Gianni Subba, 25, of Kuala Lumpur, Malaysia. They will battle it out in three five-minute rounds in the flyweight division. In the second match on the main card, Michelle Nicolini, 36, of Sao Paulo, Brazil will face Iryna “Delsa” Kyselova, 22, of Donskoe, Ukraine. They will compete in the catchweight division. Nicolini is a women’s Brazilian jiu-jitsu legend. An eight-time BJJ world champion and Hall-of-Famer, she has elite grappling skills that have brought her great success since transitioning to the cage as she now owns a solid 4-1 professional record which includes four impressive submission victories. In November 2016, Nicolini made her ONE Championship debut, figuring in a first-round submission victory over Mona Samir, 28, of Egypt. An extremely technical grappler, Nicolini is scheduled to take on a Ukranian opponent in her next appearance. On the other hand, Kyselova is a Europe West Fight Champion and a top-notch grappler. She is 11-2 as a professional and will be making her ONE Championship debut.